She was excited to discover that you could make your own motel sign on the show's website. It pulls your last name from your Facebook page so we took that part out and added my name with a font as close as we could find. Can I book you a room? Are you a Bates Motel fan? Gee, that place looks spooky! Still, it could be fun to explore ;) Book us a room! Love the art but we don't watch the show because we don't do scary!! EEEEKKKKKKK!!! !Love the artwork but there is no way we would watch the show. We don't do scary at our house either. Oh we will book a room for sure. That looks like fun, a little scary but some fun for sure. What great Caturday Art! We would check in! That is very cool. I am too scared to watch that show. I love this! 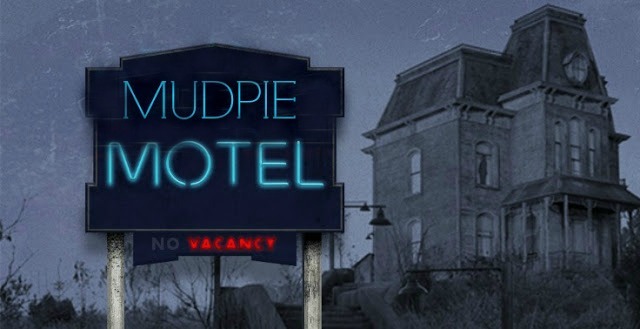 Although I for some reason have never watched Bates Motel, I usually love these eerie sorts of shows and settings. Which is why I love your Caturday Art so much! Purrs! TW doesn't like scary stuff; Pop loves X-Files so you never know. I don't see Mudpie's face in the window though. That looks like a scary place to stay!